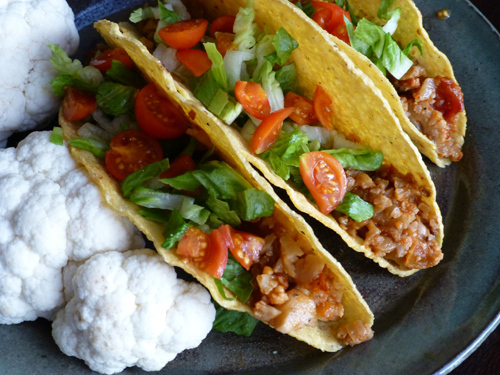 This is a great way to make a totally-veggie dish that is yummy, filling, and doesn't take forever; and your family may not even recognize they're eating cauliflower! Stir in taco mix and garlic, and cook for 2 minutes. Add diced tomatoes and cook until everything is soft. Serve warm with tortillas or taco shells, avocados, salsa, and chopped greens on top. Time saving tip: After steps 1 & 2, put everything into the slow cooker, give one good stir, then set on low for 5 hours.